You are here: HomenextTransportnextTransport - shipsnextYANTLET in the Thames. 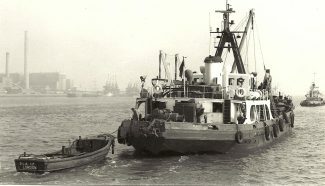 The PLA vessel YANTLET in the Thames. Note the Tilbury A power station in the background. 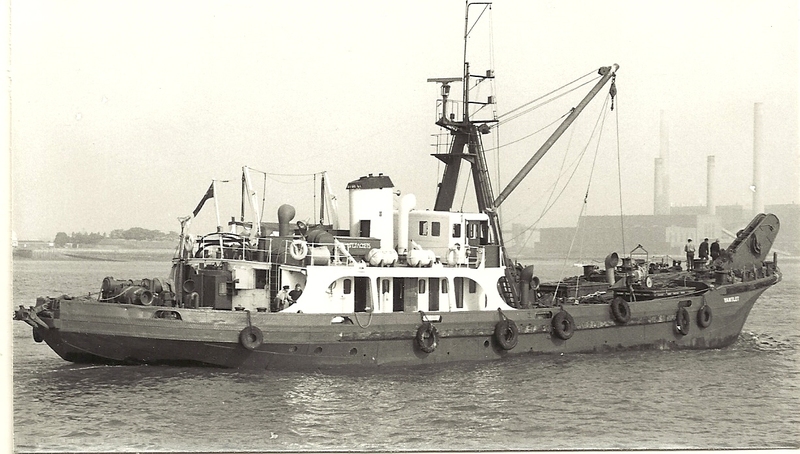 This is a great photo of a great salvage vessel. The Port of London Authority salvage vessel YANTLET was built in Scotland in 1955 and of 471 tons gross. After 32 years of service with the PLA, it was sold in 1987 to the first of a series of owners and areas of operation. Its next owner in 1987 was C-Lift Marine (London) Ltd, of Sandwich, Kent. It then went to owners in Aberdeen, Abergele and Guernsey. Its last recorded owner, Mountfield Services Ltd, of Guernsey, bought the vessel in 2000 and it was put up for sale in the following year. I do not have any information on its present owner, but apparently it is somewhere in Nigeria. If you “click” on the picture, you will be taken to a full version of the picture. If you are using Internet Explorer you can then “right click” and one of the options is to “save picture as” which will save a copy on your computer for your personal use. NOTE: Jack Willis owns the copyright to these pictures and they must not be republished without his permission. I like the photos you have posted of the Yantlet. Is there any chance you could mail me copies of these? Do you have a connection with this ship? I have a scale model of it which came from its original builder’s yard on the Clyde. I would love to hear from anyone who crewed on her while with the PLA. Sadly she now lies somewhere up a creek in the Delta region of Nigeria – never to be seen again.